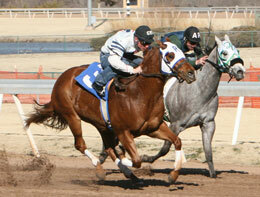 Two-Year-Old training races continued this week at Remington Park. OKLAHOMA CITY, OK�MARCH 6, 2013�Royal Vista Ranch stallion's WAVE CARVER, PYC PAINT YOUR WAGON and IVORY JAMES continue to dominate training races at Remington Park. On Wednesday, WAVE CARVER sired two winners while IVORY JAMES, and PYC PAINT YOUR WAGON each got one. However, it was Promise Me Pyc who posted the second fastest clocking from 88 two-year-olds participating in 12 schooling races at the racetrack. She raced up close after the break, finished second under urging to clock a time of :13.53 for owner's Randy and Stacy Charette-Hill. Stacy also conditions the PYC PAINT YOUR WAGON filly out of the Pie In The Sky mare Pie Sky Promises. Trainer Eddie L. Willis saddled two winners on Wednesday, by world champion WAVE CARVER. They included Cold Hearted Shark, who posted the fourth fastest time of :13.59. Racing for Wayne and Carol Procter, Cold Hearted Shark took the lead after losing footing at the start, pulled clear with a couple taps of the whip and continued on for a romping 1-� length score. Willis second winner Water Front took the lead shortly after the start and held for a half‐length score. Water Front is a homebred for Rick Sumner out of the Tres Seis mare Caddo Ridge. He was clocked at :13.92 over the 250 yards. Labor Day Dreams, by IVORY JAMES, hustled to the front after a slip at the start in the 12th race. He took the lead and held the advantage for the win. The homebred, out of Grade 1 winner All About Ease by First Down Dash, races for Bobby D. Cox and is trained by John Buchanan. For a complete list of today's (Wednesday) training results CLICK HERE. Training race replays are available for viewing on www.oqhra.com. The American Quarter Horse & Mixed-breed Season runs from March 8 and continues thru June 2 and marks the start of the 25th Anniversary Year of Horse Racing at Remington Park. Normal post time on Thursdays, Fridays and Saturdays is 6pm with Sunday afternoon racing offered at 1:30pm.